2U Flat rack cabinet 300mm 19" with 20 cage nuts, washers and screws provided. 2U 19" flat rack cabinet with 20 cage nuts, washers and screws provided. 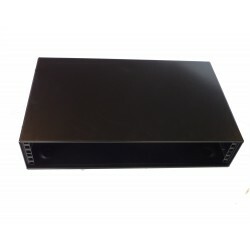 We have produced this item due to the many requests from our customers to provide a small case/housing that could be easily be mounted on or under a computer desk or use as a front room media centre. Approximate dimensions for this box are, 490mm wide, 105mm high and 300mm deep and weighs in at around 3.5 kilo's. The box has rolled safety edges on front face and rear face, as well as looking good, it’s a cool safety feature. The box outwards indents on the bottom.